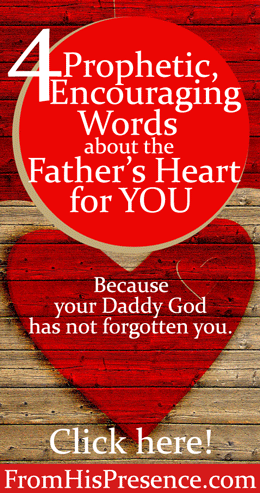 4 Encouraging Words About the Father's Heart for YOU! Dear reader, this post is actually from the archives, but it’s been burning in my heart for days. I felt like the Lord wanted me to share these four prophetic, encouraging words with you again today. They are beautiful words from Him to you, and they are about the Father’s heart for you. Oh beloved, your Daddy God loves you so much. I pray that the Holy Spirit will minister to you powerfully as you read. 1. I have not forgotten where you’re at right now. I see you and everything about you. I will take care of everything that concerns you. YOU just seek Me. Seek My face and live. I am the Resurrection and the Life you need. As you continue in My presence and look in My eyes, you will find strength and help in Me … because I AM your Strength and Help. It’s all about Me. Just look at Me, and I will take care of you. 2. Beloved child, I know you. I know everything about you. I know your sitting down and your rising up. I know what you ate for breakfast, lunch, and dinner. I know your thoughts. No one in the world knows you as intimately as I do. And My child, no one in the world loves you as thoroughly as I do. I gave up everything for you. You are My heart. I have great delight in you. Never think that you are letting Me down, beloved, for I know You and I hold you in the palm of My hand. I am with you to teach you and build your life. Look to Me and ask Me for help, for I will always give it. My plans for you are greater than you have EVER imagined. 3. Fly, fly, fly. Precious child, I desire for you to mount up on My wings. Soar with Me. It’s easier than you know. All you have to do is feed on Me, and I will raise you up. Delight in Me, and I will transport you to higher places than you could ever go alone. Trust Me. Depend on Me. I am with you to cover you and comfort you. Lift up your eyes and gaze upon Me. You will find refuge in the shelter of My embrace, and in My arms you will find your wings. 4. Oh, how I love you. HOW I love you. My love for you is more vast than all the oceans combined. My love for You reaches higher than the highest heights, and it goes lower than the lowest depths. Whether you are high or low, My love envelops you where you are. My love for you is stronger than any attack of the enemy. My love for you can go deeper in your heart than you ever imagined it could go. Let My love soak into you. Absorb it. Revel in it. Breathe it in. My love will set you free. Dear reader, Daddy God loves you so very, very much. May you sense His love and affection and feel His arms wrapped around you all day today in Jesus’ precious name. If one or more of these words particularly spoke to you today, would you leave a comment below and let me know? Thanks! 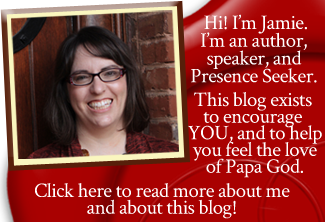 Related: Read about how to start absorbing God’s love for you in How To Feel Like God Loves You. Thanks for this reassuring message. It has really blessed me. I really enjoy your writings. May the Lord continue to be with you, in Jesus’ Name! I’m so glad to hear that Daddy God blessed you, Sanku. Thank you so much for reading and for letting me know! Dear Jamie please pray for me at this present moment for at this time i feel like god has forgiotten me or punishing me for not giving him all the glory and praise. Please pray for me right now because i have been detained by the uk border agency enforcement officer and i am so troubled and all the prayers i can get, thank you please pray for oter individuals who are in similiar situation, God bless you. Thank you Jamie, that was wonderful, Holy Spirit ministered to me in a wonderful way , Bless God. Thanks so much for that encouraging word from daddy God. Just what I needed as I sat down at work so not ready to work. I needed to hear that. It spoke right to the core of my heart. Be blessed Jamie and keep reaching higher. There’s still more. Thank you, Jaime! Just what I needed to hear ? Thank you for this beautiful reminder of the Father’s love. It flowed over me like honey as I was reading it. It went straight to my heart and will “stick” with me all through the day. You are a blessing Jamie! Gobs of love heaped back on you!!! I am so grateful for our living, relational God, and the growing unity of His Church. Last night, I felt so guilty about ending the day without having quiet time with my Father. In my prayers, I found myself telling Him that I wanted to see His face. I told God that I was desperate for Him. I asked Him to guide me, teach me, and correct me. I also asked Him to be very present in my waking, sitting, rising, and every part of my day. As you can imagine, 1 and 2 spoke very powerfully to me. These words were a loving confirmation of His answering my prayers. Bless you and thank you so much for sharing this. That’s amazing, Kelsey. And isn’t it wonderful that Jesus promised to manifest Himself to us? (John 14:21). Our Daddy God wants to spend time with us even more than we do with Him! He’s awesome. Thanks for reading and sharing! Thank you so much for this! I believe God can restore anything. Can you please pray for the restoration of a friendship. About a year ago me and my friend went through some stuff and our friendship ended but I truly believe God wants to restore it. He was just like my brother and I miss him and pray for him everyday. I know God can restore it and he had told me before but sometimes it’s hard because I wanted in my timing but I know Gods timing is always perfect. Thank you so much. He definitely can, Ana. He wants us to be at peace with all people. I prayed for you and your friend. 🙂 Thank you for sharing! Thank you very much for this word. My family is going through the storm right now, and I been feeling so heavy laden. God Bless you! May Daddy God strengthen and lift you up today. 🙂 Thank you for reading and sharing! Bless you sweet sistah and lots of squishes headed your way!!!!!!! I receive ’em all! Thanks so much, and may you have a woooooonderful week! It all speaks to me, especially to fly and soar, like Isaiah 40:31. I would like to run and not be weary, I’ve really had to learn how to find His rest. Thank you Jamie…love and blessings to you. Thank you so very much for this today!!! I have been asking the Lord and praying about some problems in my life, about moving from my home to a different place and just to do the right thing at the right time. I felt like I wasn’t hearing Him at all. Then I felt like He didn’t care. I saw something on FB about a prophet who would give you a word from the Lord. But it costs $40. So, I sent the $40. I have heard nothing. I was so disheartened. Then I found this today, and I’m just so encouraged now. He hasn’t forgotten me. He isn’t mad at me. He still loves me. He wants the best for me!! I just get lost and sidetracked sometimes.!! Bless you!!!!! Ugh! That’s horrible! Charging for a prophetic word? I can understand if you’re asking someone to study into a dream for you or something like that that takes time and labor, but not for a prophetic word from the Lord. I’m so sorry. Daddy DOES love you, Patti, very much. He ADORES you. He DELIGHTS in you. He is your glory and the lifter of your head. He has amaaaaaaazing things in store for you, and He will instruct you and teach you in the way you should go and guide you with His eye upon you (Psalm 32:8). May our Daddy God minister His love to you today and may you feel His arms wrapped around you and keeping you safe! Thank you so much Jamie..I needed this today..And I receive it in the name of Jesus! Thank you so much for this inspiration from God, My heart felt every word! God bless you! Love how you address the Most High God as Daddy God. Thank you for setting up a website to encourage and bring prophetic Word to God’s people. May God bless you for this. Thank our Father for giving you these words I so needed to hear today. He is so good. i needed to hear this. thank you!! Perfectly timed Word. My soul needed it. Thank You, Abba. Thank you Jamie, this is just what I needed to hear. Jamie! I’m so sorry not able to attend the conference! Thank you for this word..
? without the dark we’d never see the star.
? Jesus said to her, I am the ressurreaction and the life. He who believes in me will live, Even though he dies, and whoever lives and believes in me will never din.
? Jesus is my saviour!!!
? I have crucified with Christ and I no longer live, But christ lives in me, The life I now live in the body, I live by faith in the son of god, who loved me and gave himself for me.
? For i can do everything through christ, who give me strength. God bless you my sister in Christ, that just went to the bottom of my being………….I cannot speak. It is awesome! 🙂 thank you!!! Had a very very bad day..my son is at it again with his addiction..i cried screamed and plead to God almighty to please purify and heal him once and for all and give me my family back pleasethen I read your post that I’ve been trying to catch up to because work has been so crazy and home nonetheless…….i ask God to take me with him..i can’t take it no more.. They all spoke to me as those are actually what am praying for. Glory to God. God bless you my Sister in Christ, great Words from DADY GOD am really inspired! Am at Peace, because of this encouraging words from FATHER. Hallelujah!!! Please, keep posting me New words from DADY! What am I really made of when I am all alone? When the music fades and all has been stripped away where does my faith and hope lie? Will my faith stand? is it built on sand or on the rock of my salvation? will I praise Him in the valley of death or will I praise Him only on the mountain top ? IAm reminded that it’s through the valley we are challenged to grow it’s through difficulties that we are stripped of impurities that hinder growth in fulfilling Gods purpose Oh but when we are purfied and tried by fire Our Faith In Jesus sparkles and shines through the hardened places of the heart and All that is left to do Is surrender and be obedient to His will so that we can receive the promise. I have many questions for you. Will you counsel me? Hi April. Thanks for reading. I do not do counseling, but I have a wonderful mentoring team who can help if you need mentoring. Read about them here and here. I’m gonna be honest, my day was filled with weeping ! I’m really thankful that I have seen this post! Thank you for your diligent work in Christ! God always shows your posts, and it is a blessing ! I’m sorry you are going through a hard time, but I praise God for blessing you! Thank you so much for posting and sharing this. This is one truly priceless message from Abba.